Most posts have been about the new life in India that my wife and I experience. There is so much that is new to us that this is easy to write about. Arunachala has been an holy mountain since the dawn of India life. It is written about in the Rig Vedas, purported to be the oldest of the Vedas, which would make it the oldest religious book there is. That is the holy place! Of all Arunachala is most sacred. It is the heart of the world! Know it to be the secret Heart-center of Siva! In that place He always abides as the glorious Aruna Hill! Oh Arunachala, I have exposed your secret doings. Do not be angry. Let your grace be on me. When we first came to Tiruvannamalai, a small city that has grown around a major Siva temple, Arunachaleswara Temple, over the last 2000 years, I would rise before dawn and go up to the rooftop and just sit and meditate with Arunachala until dawn. I would then watch for a while as the city awoke. After just a few days of this I said to Carol, “We could live here.” She did not treat me like was crazy, though she probably thought I was. Now, several years later I have retired and we have uprooted our nice life the the USA, gotten rid of almost everything we owned, and moved to South India to be with Arunachala. In the last ten years spiritual practice has become the most important thing in our lives, and we want to use this part of our life where practice is the main focus. 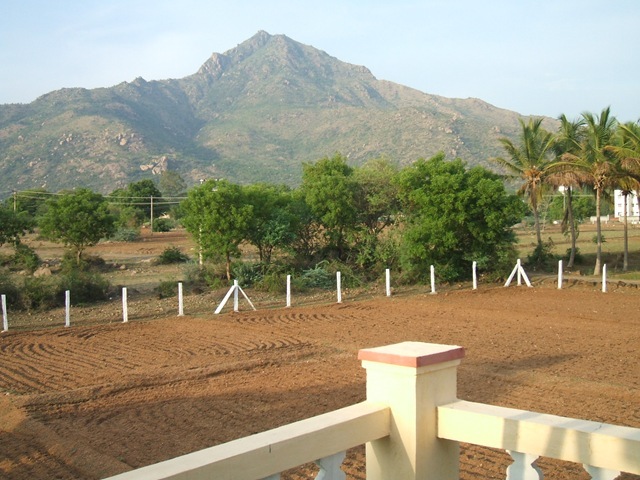 Now we are here, ‘living in the embrace of Arunachala.” I still rise before sunrise and go up to the roof, now of our home, named “Brindavanam” by the previous resident who put in the wonderful orchard and garden that surrounds this house. Carol and I are up on the roof with Arunachala several times each day. Even when not on the roof, Arunachala is the dominant presence for miles around. It is always present. Thy fire burns away ignorance. I stand in your Silence. Knowledge of Thee is All.